"The essential function of architecture is to limit a volume from the non-architectural extent of open space, so that within it man may develop his living activities undisturbed by weather inclemencies. The unique feature which distinguishes architecture from other plastic arts is precisely this dealing with internal hollow space." 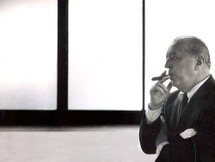 Félix Candela Outeriño (January 27, 1910 – December 7, 1997) was a Spanish architect known for his significant role in the development of Mexican architecture and structural engineering. Candela’s major contribution to architecture was the development of thin shells made out of reinforced concrete. Félix Candela died at the age of 87 in 1997 in North Carolina. Felix Candela was born in Madrid, Spain in 1910. In 1927 Candela enrolled in La Escuela Superior de Arquitectura (Madrid Superior Technical School of Architecture), graduating in 1935; at which time Candela traveled to Germany to further study architecture. Early after he started classes, he developed a very keen sense of geometry and started teaching other students in private lessons. In his junior year, his visual intelligence and his descriptive geometric and trigonometric talent helped him catch the eye of Luis Vegas. Vegas was his material strength professor, and gave Candela the honorary title of “Luis Vegas’ Helper”. While “helping” Vegas, Candela entered many architecture competitions and won most of them. Unlike many of his peers, Candela didn’t show intellectual or aesthetic efforts in school. He didn’t even like pure mathematics. When Candela was a student in Madrid, the schools taught the theory of elasticity where Candela assisted the professors and even tutored other students. His studies ended very quickly when the Spanish civil war began in 1936. When Candela returned to Spain to fight, he sided with the republic and fought against Franco. Candela became a Captain of Engineers for the Spanish republic after a short period of time. Unfortunately, while participating in the civil war, Candela was imprisoned in the Perpignan Concentration camp in Perpignan, France until the end of the war in 1939. Candela had fought against Franco; therefore he could not stay in the new Spain as long as Franco was the head of state. After his name was selected with a few hundred other prisoners, Candela was put onto a ship bound for Mexico, where he would start his career. Candela married Eladia Martin when he moved to Mexico from Spain; there, they raised a family. In his early life, Felix was active in sports, particularly rugby and skiing. Candela worked very hard during his lifetime to prove the real nature and potential reinforced concrete had in structural engineering. Reinforced concrete is extremely efficient in a dome or shell like shape. This shape eliminates tensile forces in the concrete. He also looked to solve problems by the simplest means possible. In regard to shell design, he tended to rely on the geometric properties of the shell for analysis, instead of complex mathematical means. Around 1950 when Candela's company went to design laminar structures, he started researching journals and engineering articles for as much information as he could find. From this, he started questioning the behaviour of reinforced concrete with the elastic assumptions and concluded they are in total disagreement with each other. (Faber 1963) Candela has said on more than one occasion that the analysis of a structure is a sort of "hobby" to him. 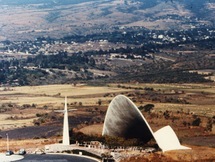 Félix Candela worked as an architect upon his arrival in Mexico until 1949 when he started to engineer many concrete structures utilizing his well known thin-shell design. Candela did most of his work in Mexico throughout the 1950s and into the late 60s. He was responsible for more than 300 works and 900 projects in this time period. Many of his larger projects were given to him by the Mexican government, such as the Cosmic Rays Pavilion. In 1956, Mexican President Adolfo Ruiz Cortines said “Nothing could be more serious than to sit in the shade of the buildings we are about to build,” foreshadowing the many construction projects to come. Ruiz Cortines came up with a budget to enable his construction declaration to come true, requesting $81,200,000 (pesos) more funding than was used in 1955. Luckily for Candela, $20,300,000 (pesos) of this funding was to go towards public works. Candela also benefited from the budget implemented by Ruiz Cortines in the area of education. Candela became a professor in Mexico, which is what he did for the remainder of his career.